Trying to run errands with a newborn is hard. Even though YOU might just need your purse and you’re ready to go, it seems like it takes a whole car full to bring everything you might need for your baby. 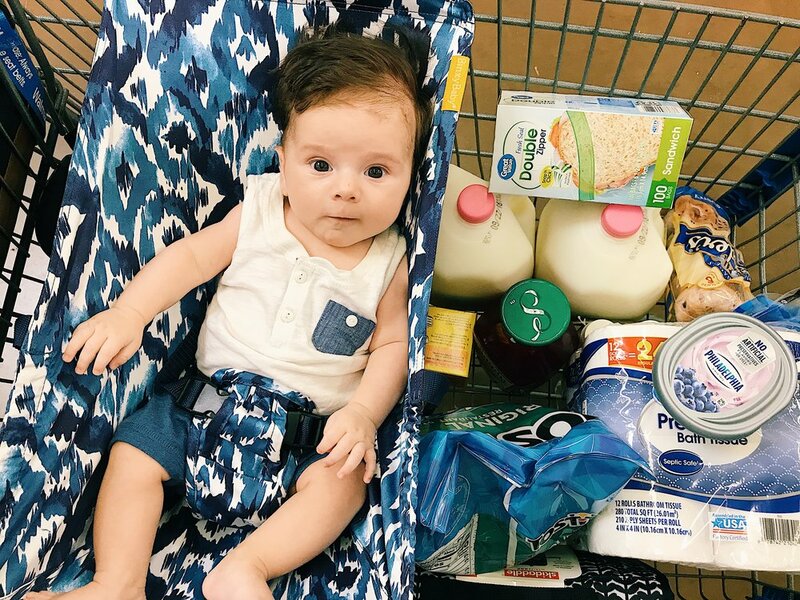 By the time you put the diaper bag and carseat into your cart, it’s pretty much already full. I would have to prioritize items I needed, balance them carefully on the bottom shelf, and stack them around Parker. Add in the fact that you’re on a time limit before it’s time for them to eat or be changed again, and you have one stressed out, rushing momma. That was until I started using Binxy Baby’s Shopping Cart Hammock. You all, I’m not even exaggerating, I’’m obsessed. 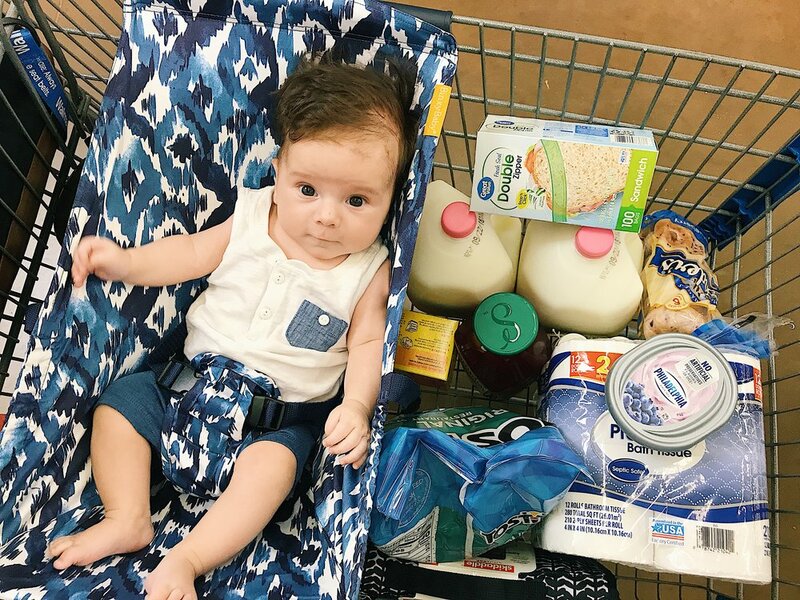 It fits most standard grocery carts and you can either put just your baby in it, or the carseat as well. It holds up to 50 pounds and can be used from birth, up until your baby can sit up unassisted, so usually somewhere around 6-8 months. Think about how many times you go to the store, any store, in that amount of time. 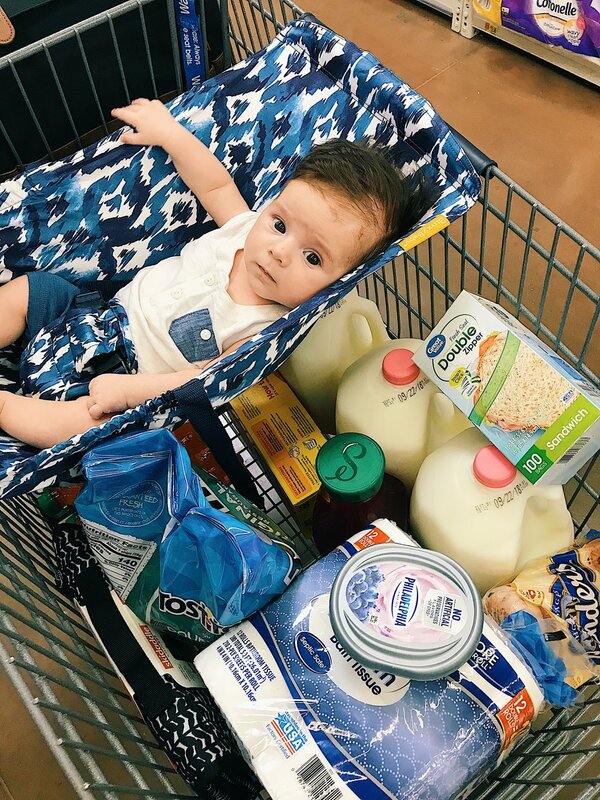 So for those first several months where you still need to be able to get stuff done, but before they can sit in the front of the cart, this is literally the perfect solution. It’s small and compact, so I can keep it in my diaper bag. 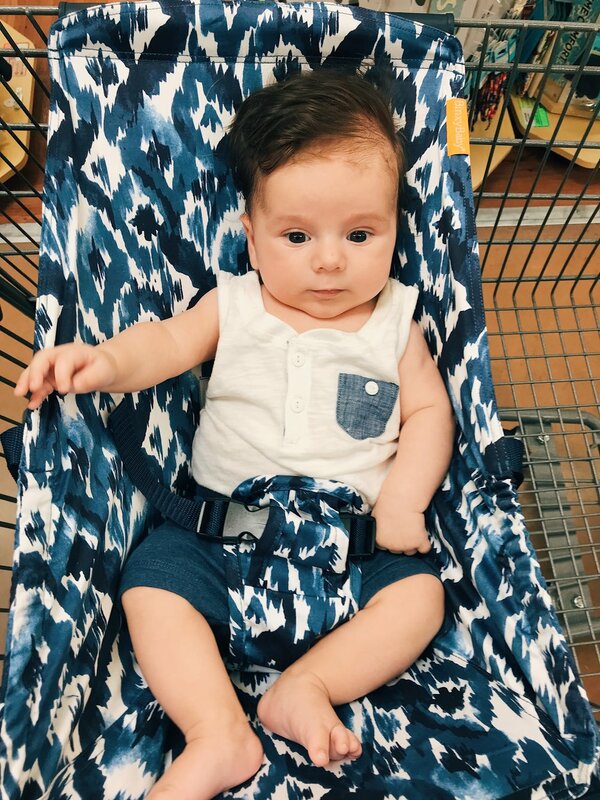 I’m telling you it is worth every penny, it makes shopping with a baby both safe and easy. The hammock clips into most carts quickly and easily. You can even fit it on the shopping carts at Costco on the narrow end. It hangs elevated so that you have plenty of room for groceries, both around and underneath your baby. Which when I’m buying four gallons of milk at a time, is a huge help. With Parker being my first kid, you know safety is especially important to me. 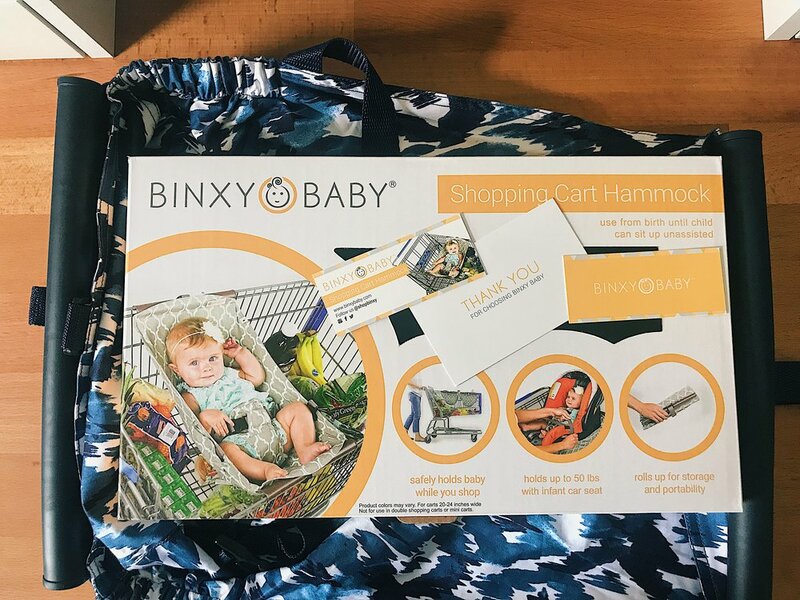 Binxy Baby’s shopping cart hammock meets or exceeds all applicable safety standards. It has a clip in belt for just your baby and also has a strap if you choose to use it with your carseat. Oh you know, just lounging. He really was nestled in, ready to roam the aisles (read: mainly stare at the lights). Plus it was fun to have him right in front of me so that I could play and talk to him the whole time which made things stay really happy and smooth! I’m telling you all, there is a reason that this has been featured in Parent’s Magazine, named a must-have by Tori Spelling, and declared a “top mom hack:” by Baby Center. It has made running errands so much less intimidating, grocery carts actually functional, and running around town together kinda fun! The Shopping Cart Hammock comes in 7 color options. Check out the different options and get 10% off your order through me here. I’m telling you, you’re going to love it!